If you have any questions or want to enquire about dates, use our form to contact Wendy & Ian Gregory or see their website for more information. Ian and Wendy greet you warmly with tea and homemade cake by the fire in their listed Georgian home – you’ll feel relaxed in no time with such easy hosts. 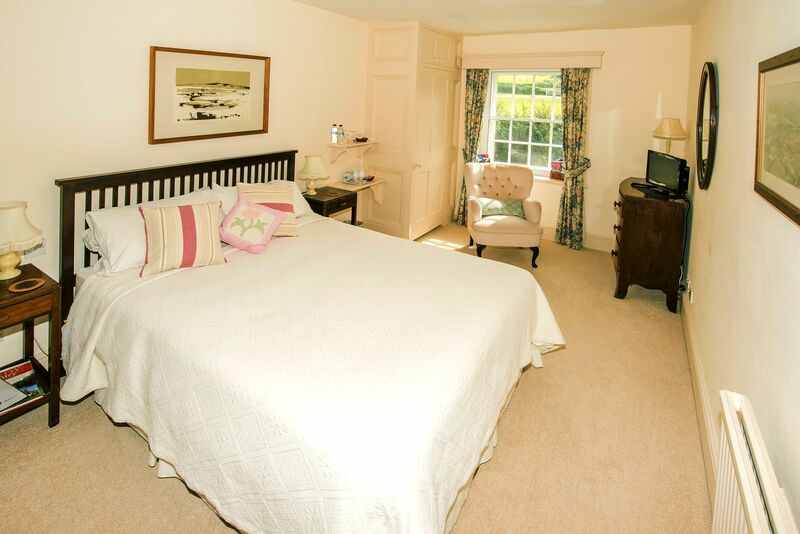 Upstairs you’ll find roomy bedrooms with pretty village views, fresh flowers and interesting books to dip into. You breakfast well on sausages and bacon from the local farm, tomatoes from the greenhouse in season, rhubarb and gooseberry compotes from the garden and homemade jams. Plan your walks through this AONB or join the Macmillan Way (half a mile). Bring bikes and cycle the National routes which criss-cross the area, have a day of fossil hunting at the coast, climb Eggardon Hill or Golden Cap for far-reaching views – you’re in the heart of Hardy country. Return to look around the village, visit ‘the best village stores in Dorset’, explore the church with the highest village tower in Dorset, an Art Deco baptistry and a splendid William Morris window. It’s well worth taking a turn in the beautifully-kept garden too. The local pub, the Fox and Hounds, is a short stumble from here. Minimum stay: 2 nights at weekends. 2 nights in high season. We had a 2-night break at Fullers Earth which proved an inspired choice. Wendy and Ian are excellent hosts, and we had a very comfortable room. Lovely house in the small village of Cattistock which has a church, post office/general store and pub - all you need, in fact ! Good starting point for visiting Hardy country as well as the lovely town of Sherborne - a gem. We would happily return. Fullers Earth is a delightful place to stay. Wendy & Ian are lovely hosts who made us feel so welcome in their very comfortable home. Our room overlooking the courtyard was spacious and homely. The breakfasts were excellent. We enjoyed sitting in the firelit and cosy drawing room of an evening, following very good meals at the Fox and Hounds. It was great to use the short cut! This is a perfect b & b for those wanting a peaceful break with some great local walking in this part of Dorset. Thank you again, Wendy & Ian. A lovely old house in a very interesting village with equally interesting, warm hosts. It's a gorgeously quiet part of Dorset too. Ian and Wendy at Fullers Earth are delightful hosts for whom nothing is too much trouble. The room we had was comfortably and stylishly appointed, but very homely and comfortable. The breakfasts are varied and well cooked on the AGA with many home grown fruit options and home made jams and marmalade. For a break in Dorset not to be missed. 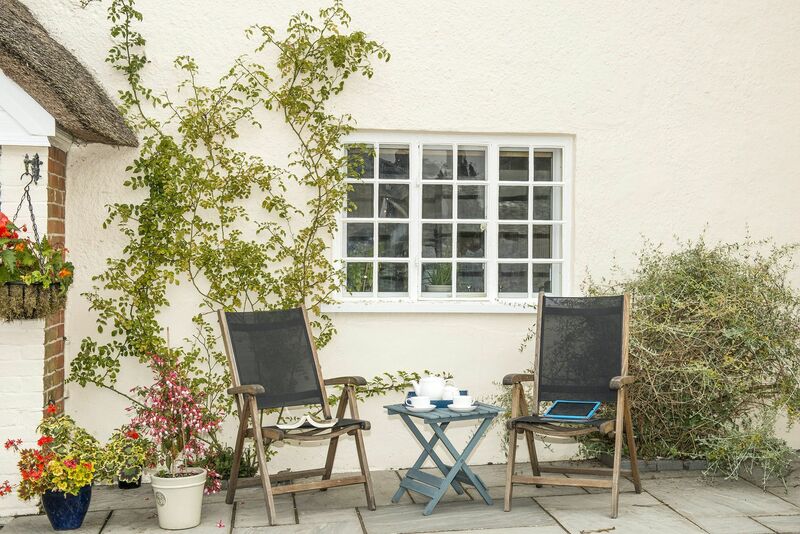 We can really recommend this lovely B&B! Wendy & Ian made us feel so welcome in their beautiful home. We enjoyed delicious cake & tea on arrival, which was such a treat after our journey. Our room was spacious, very clean & comfortable with a view over the courtyard. Breakfasts were wonderfully tasty too. It was fun using the 'shortcut' to the village pub every night for good food. We spent a restful, relaxing couple of days here and will look forward to returning as soon as we can; it is a truly special & delightful place. Thank you Wendy & Ian, for looking after us so well. Fullers Earth is a delightful B&B, thoroughly recommended. The location is perfect, the hosts, Wendy and Ian, warm and welcoming, our room was comfortable and the breakfast delicious. In every way a really special place. Fullers Earth is a beautiful, historic house in a pretty village in the heart of the Dorset countryside. We were welcomed by Wendy and Ian with tea and home made cake in the elegant drawing room, then shown to our comfortable bedroom overlooking the courtyard. Our room had everything we needed for our visit, and we could not fault anything.... we were even shown a shortcut footpath to the local pub, where we enjoyed a fabulous meal. Breakfast was delicious, with home made gooseberry or rhubarb compotes. 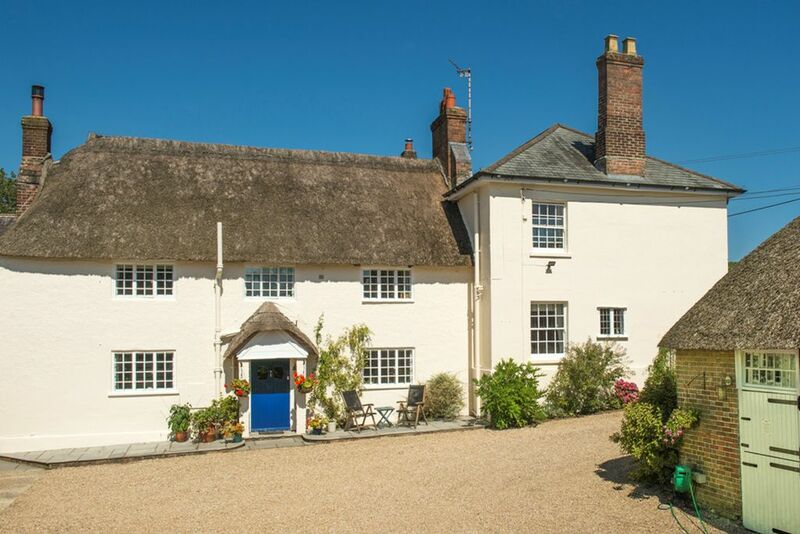 This is a great base for touring Dorset, with easy access to the coast. Wendy and Ian treated us to the warmest of welcomes at their beautiful home. 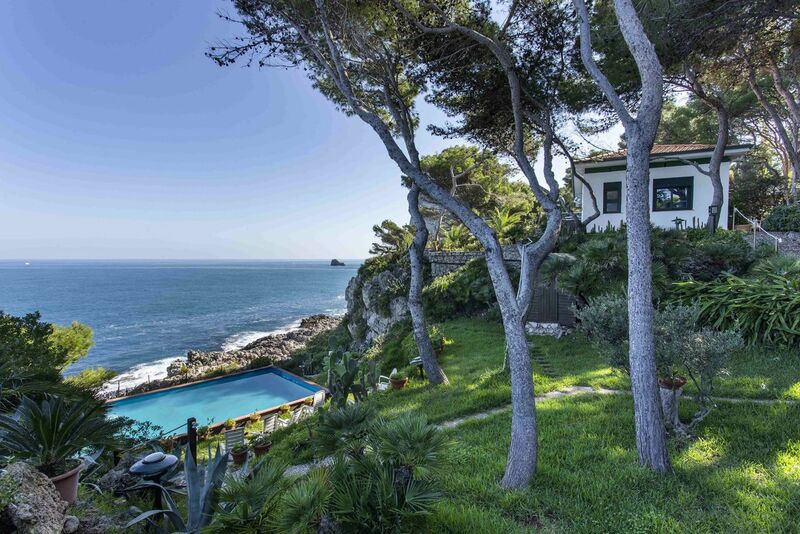 The house and gardens are immaculate and the rooms and breakfast couldn’t be bettered. Nothing was too much trouble, Cattistock is a lovely quiet village with a very good pub in the Fox & Hounds. We look forward to future visits. Our stay was first-class in every sense. Beautiful house, garden and, above all, hosts. We were warmly welcomed by Wendy, together with delicious home-made cake and tea in our guest lounge. Cosy bedroom and comfy bed. An excellent traditional pub with good food, beer and wine, just through the garden gate. Brilliant breakfasts: fruits from the garden, home -made preserves and marmalade, Dorset cereal, locally baked lovely bread and full English cooked in the Aga. Great tips and information from Ian and Wendy regarding our plans, set us up perfectly for the days exploring beautiful Dorset. We were so well looked after by Wendy and Ian. This is a very good B&B. We have never had such a comfortable bed. The breakfasts were superb. The house was delightful. It is brilliantly located. The Pub was excellent and a whole 2 minutes walk away. Our hosts could not have made us feel more welcome. Altogether a very positive experience. Ian and Wendy are wonderfully welcoming hosts, lovely house, comfy beds, delicious breakfasts with fruit from their abundant garden - and only 100 yards across the field to the pub in the evening! So much to see in the area. We'll be back! We received such a warm welcome on our arrival and loved every minute of our stay. Our room was extremely comfortable and the fact that the excellent local was accessed through the beautiful garden was an amazing bonus. We planned to do a long walk and we're provided with directions, maps and a lovely route to our start. All in all a fantastic find. We loved our stay at Fuller’s Earth B&B, an historic old house set in beautiful gardens. Welcoming, friendly hosts Wendy and Ian Gregory served excellent breakfasts in their gracious dining room and based on their broad local knowledge they were able to suggest a wide choice of outings and tourist sites. The village pub offered great evening meals too. We certainly hope to return. Myself and my two friends had a lovely stay at Fullers Earth. The beautifully decorated rooms were very comfortable and tea and home made cake in the guest living room was a real treat after a day of walking. Wendy and Ian are wonderful hosts and even recommended walks for us on both days which were spot on. Breakfast in the generous dining room was delicious, particularly the rhubarb and berries from the garden and home made jams. I would definitely recommend Fullers Earth to anyone wanting to visit this beautiful part of Dorset. This bed and breakfast was one of the very best we have ever stayed in. The warm welcome, spotless and comfortable rooms, delicious food and beautiful garden made it a perfect place to stay, with the added benefit of an excellent pub/restaurant within easy walking distance. We were made welcome the minute we pulled up on the drive. Our room was light, roomy and comfortable and we also had the use of one of the downstairs reception rooms and garden. Picturesque village with a fabulous country pub with friendly locals, Brilliant! We had a cosy and comfy stay in chilly March. Breakfast was delicious and jolly with Ian regaling us with village gossip whilst Wendy looked after us with a delicious breakfast which consisted entirely of local produce! A delightful spring break. Absolutely wonderful stay, thoroughly recommended . My boyfriend, parents and I all stayed here on a stop over stay from Cornwall and I'm glad we did. Not only are Wendy and Ian two lovely, interesting and very welcoming people, but the house is stunning inside and out, with beautiful rooms and ensuites. The pub is a stones throw away, which is most convenient for the weary traveller. What's more is you wake up to a superb fresh breakfast, cooked to whatever preference (eggs were perfect!) and fresh fruit hand picked by Wendy from their charming garden. Happy memories made here, will be back! What a delight, made all the more so by Wendy and Ian our wonderful hosts. Wendy made sure we were well cared for and Ian provided us with a wealth of information and maps to enjoy our 3 day stay to the fullest. Breakfasts were a treat. So pleased we found Fullers Earth on Sawdays. This is probably the best B&B we have stayed at. Others beat it in individual ways but overall we could hardly have been more impressed. Great hosts and a lovely house in a most attractive village with a really good local is hard to beat. Our room was excellent, breakfast superb and our discrete but friendly and attentive hosts could not have done more for us. Well done Wendy and Ian. It’s quiet here away from the coast in the gentle Frome valley with patchwork quilt fields, narrow lanes and villages with thatched houses. Cattistock, famed for its annual knob throwing contest, is a thriving community with a good pub, post office and stores, tea room and very fine church. You’re just 20 minutes from the Roman towns of Dorchester, Sherborne and Bridport for restaurants, markets and independent shops. The Jurassic Coast – Lyme Regis, West Bay, Portland and The Isle of Purbeck - is a bit further. Great village pub with wonderful atmosphere just 3 minutes walk away through the garden. This is Dorset's 3 times Country Pub of the Year award winner - a proper local. Other good pubs and restaurants in the area. See Cattistock’s church with its William Morris window, renowned Arts and Crafts Baptistry, and the highest village church tower in Dorset. Beautiful Sherborne and Abbey 20 minutes away. Bridport's brilliant Saturday market also 20 minutes and you drive over glorious Eggardon Hill to get there. Visit Hardy’s Casterbridge (Dorchester), Weymouth, Lyme Regis and rugged Portland. There's the Tank Museum, Monkey World, Weymouth Sea World, Hardy's Cottage, Lawrence's Clouds Hill and Jurassic fossil hunting - something for everyone, the list is endless. Enjoy the changing face of the Jurassic Coast, a World Heritage site. Visit Lyme Bay, Portland, Chesil Beach, Lyme Regis, West Bay (Broadchurch! ), Lulworth Cove, Durdle Door. All places to amaze you. Activities: Walking - a huge number of beautiful walks in West Dorset; Golf; Cycling; numerous water activitities: and brilliant fossil hunting around Charmouth. We are happy to advise. Wendy and Ian moved to Dorset in 1980 so they are ‘almost’ accepted as locals! They moved to a much-neglected Fullers Earth in 1995 and restored it. They are old hands at B&B – winners of Sawday’s ‘Old Favourites’ award in 2014/15 – and both enjoy meeting people from all over the world. They love to share this special part of the county which they fell in love with so many years ago.